With an estimated 20 - 40 Dancehall riddims released each week fans of the genre sometimes struggle to find a production worth listening to or even purchase. Quality control is one of several problems the genre has failed to tackle and this has kept more and more Jamaican artists on the outskirts of mainstream music markets but once in every blue moon comes a project that blows the lid off such a stereo type. Officially released last October the 90's Riddim by Digital Vibez Entertainment has kicked the door open and represents a refreshing sound that dancehall has been missing for the last 5 years. Digital Vibez Muzik was founded in 2010 after Digital One Productions owned and operated by Richard "Digital One" Roache and MadVibez Entertainment operated by Michael "MadVibez" Thompson was merged together with the addition of Musician, Song Writer, Producer and Engineer Gary "Shanguly" Samuels who came on board with years of experience in the industry as tour engineer for the likes of Beenie Manand Jah Cure. The 90's riddim only features a handful of songs but is a powerful representation of just how potent Dancehall has become with the likes of a new comer like Chronixx setting the tone for the project with his song entitled "Odd Ras". "Odd Ras is without a doubt the #1 song in Jamaica right now, its climbing several charts locally but its the song that everyone loves to hear and it captivate a new more positive energy that is seeping back into the music. 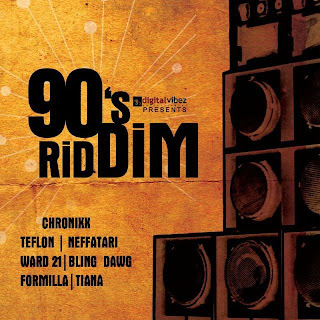 Alongside Chronixx the 90's Riddim also features Teflon, Ward 21, Tiana, Formila One, Bling Dawg and pop reggae singer Nefatari who all deliver strong lyrics reminiscent of the late 90's dancehall era" stated Richard Roache in a recent interview. While the riddim is only just getting some justice it can be said that the 90's riddim will no doubt become a classic.